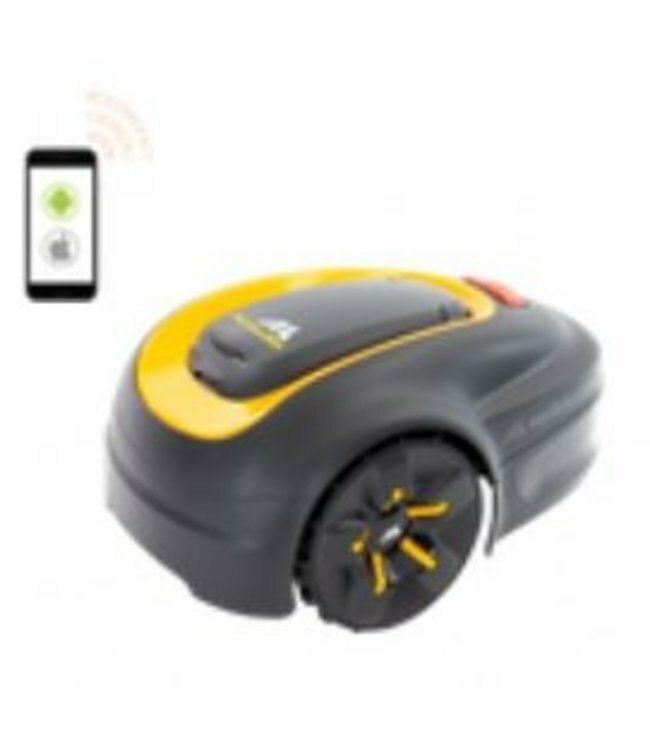 The robotic lawn mower is equipped with a lithium-ion battery. It can be used on lawns of up to 400 m2 with slopes of up to ±35 % or 19°. With a volume of only about 58 dB, the robot lawn mower is extremely quiet. A 360 ° rotatable rear wheel makes it easy for it to manoeuvre. This prevents an excessive wear of the lawn. The McCulloch Rob S400 trims the lawn with three blades mounted on a freely rotating knife disc. The cutting width is 16 cm. The cutting height can be adjusted between 20 and 50 mm. The finely chopped blades of grass fall to the ground as mulch. The grass remains provide moisture and serve the lawn as a natural fertilizer. Settings can be made not only via a user-friendly operating menu on the robot, but also via app. Via Bluetooth connection, you can also access the S400 within a range of 15 to 20 metres. For the app control, no Wi-Fi connection is necessary. Note: The app will be available in January 2019. Reliably, the robot mower follows the set weekly program – even when it rains. Using an intelligent cutting system, it can optimally adapt its mowing time to the grass growth. The robot navigates at random. When the battery level is low, it automatically returns to the charging station to recharge. It can be defined a certain point within the lawn area where the robot lawn mower should start mowing. Thanks to this remote start function, the McCulloch S400 reliably finds its way into a secluded area of the garden, which is difficult to access only through a narrow passage. This guarantees a uniform mowing result in the entire garden. With automatic passage detection, the McCulloch Rob S400 easily finds its way into narrow passages and skilfully navigates through them. This prevents ugly traces on the lawn. Collision, lifting and tilting sensors ensure great safety. If the lawn robot encounters an obstacle, it stops and continues in another direction. If the robot is lifted or tilted, the blades stop immediately. In addition, with a PIN code and anti-theft protection, it is safe from being put into operation by unauthorized persons. All accessory parts for the installation of the McCulloch Rob S400 are included in the scope of delivery: boundary wire, cable pegs and connectors as well as a detailed user manual. Your robot lawn mower is ready to mow in just a few steps! The robotic lawn mower weighs just 7.8 kg and is therefore extremely easy to handle. The McCulloch S400 can – as one of only a few robot mower models – be cleaned under running water. This makes the maintenance of the robot lawn mower particularly easy and uncomplicated.